Please note that the content of this book primarily consists of articles available from Wikipedia or other free sources online. 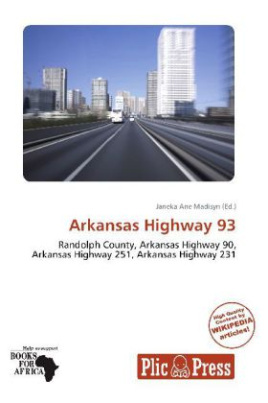 Arkansas Highway 93 (AR 93 and Hwy. 93) is a north south state highway in Randolph County, Arkansas. The route of 14.66 miles (23.59 km) runs from AR 90 north to the Missouri state line. AR 93 begins at AR 90 northwest of Pocahontas. The route winds north through forested land before a junction with Arkansas Highway 231, which connects AR 93 and AR 151 in north Randolph County. Highway 93 continues north through the communities of Dalton and Elm Shore before meeting the Missouri state line. The road enters Missouri as Supplemental route BB, also entering the Mark Twain National Forest. The route it two lane, undivided for its entire length.